There are three main characteristics of precipitation in Northern Eurasia. First, it is mostly light or modest. Second, there are strong seasonal contrasts in precipitation amounts. Third, across most of the region precipitation occurs as snow from November to March. In January, mixed (snow, rain, and sleet) precipitation occurs in the southern regions of Northern Eurasia from Moldova to Central Asia, in the Baltic states and Belarus and in the Pacific region where their frequency reaches 15-20 per cent, 10 per cent and 5-8 per cent, respectively. Across the rest of the region between 1-4 per cent of precipitation is mixed (Shumilina, 1996). Otherwise it snows. The average annual precipitation over Eurasia varies between 300 mm a-1 and 800 mm a-1 (Figure 3.9). However, there is a large range with as little as 30 mm a-1 falling over some regions of Central Asia and more than 2500 mm a-1 over western Transcaucasia. Perhaps the most remarkable anomaly is the deficiency of precipitation over Central Asia which arises from a combination of various circulation factors. Another precipitation minimum occurs over northeastern Asia. Two factors are responsible for this anomaly: high pressure dominating the region from November to March and extremely low temperatures and low absolute humidity which reduce the available water in the atmosphere in winter. Indeed, the amount of precipitable water over northern Sakha-Yakutia in January does not exceed 0.5 cm (Bannon and Steele, I960). This is the lowest amount on Earth outside Greenland and Antarctica. The decreasing winter temperatures and declining depression activity explain the general decline in precipitation landwards and northwards. This general pattern is complicated by orography. Thus in the western foothills of the Urals, precipitation increases to over 1000 mm a-1 but declines sharply in the east. The difference between the windward and the lee sides of the range create an impression that the Urals form an important boundary in the distribution of precipitation. Although the Urals do produce a rain shadow, there is little difference in the amounts of precipitation received by the East European plain and West Siberian lowland largely because depressions circumvent the Urals in the north and in the south, with their tracks converging over the Ob estuary. 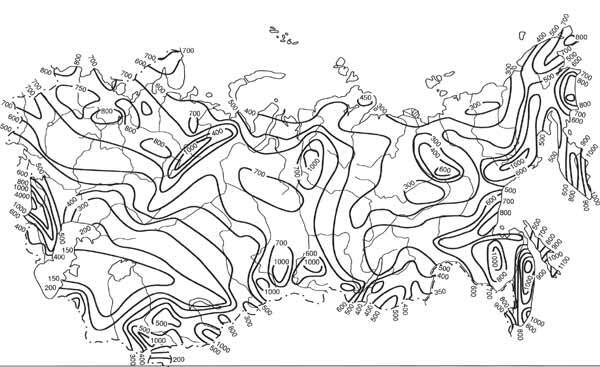 It is the orography that is responsible for the complexity of precipitation patterns along the southern border of the FSU. The precipitation anomaly occurs in western Transcaucasia because the rain-bearing depressions, arriving from the Mediterranean, cross the meridionally oriented ridges of the Caucasus and leave most of their moisture in heavy condensation. The stagnation of depressions on the windward side of the mountains, causing prolonged and heavy precipitation, is typical. A similar process occurs in many other mountainous regions causing local precipitation maxima such as, for example, in the south-western Altay, south-western Pamir or northern Khamar-Daban. By contrast, the interior regions in the mountains can be extremely dry. Across most of the continent, with the exception of Central Asia and regions of Transcaucasia and the Black Sea coast, the precipitation maximum occurs in summer as a result of the combined effect of convective and frontal activity (Figure 3.10). July is the wettest month in a broad central band extending from the western border of the FSU to Eastern Siberia between approximately 54°N and 60°N. In the north and in the Baltic region, the precipitation maximum occurs in August because of the delayed heating and convection, while between 45°N and 54°N most rainfall occurs in June. Although in summer convective storms deliver most rainfall, the role of frontal precipitation increases in autumn. Autumn is wetter than spring and in the Baltic states and north-western Russia a two (summer and autumn) maxima precipitation regime is observed instead of a simple single maximum-single minimum distribution. Winter months are the driest as depressions yield less precipitation than convective storms. The winter minimum becomes more pronounced eastwards as both depression activity and temperature decline and in Eastern Siberia monthly precipitation in winter is only a few mm. The southern part of the region, stretching between the western Black Sea coast and Central Asia, has more varied annual precipitation distributions. The western part of the Black Sea coast (between the western border of the FSU and Novorossiysk) has two precipitation maxima: one in winter, when frontal activity intensifies, and the secondary one in summer when convection develops. In the Russian-language literature, this climate is often described as Mediterranean. 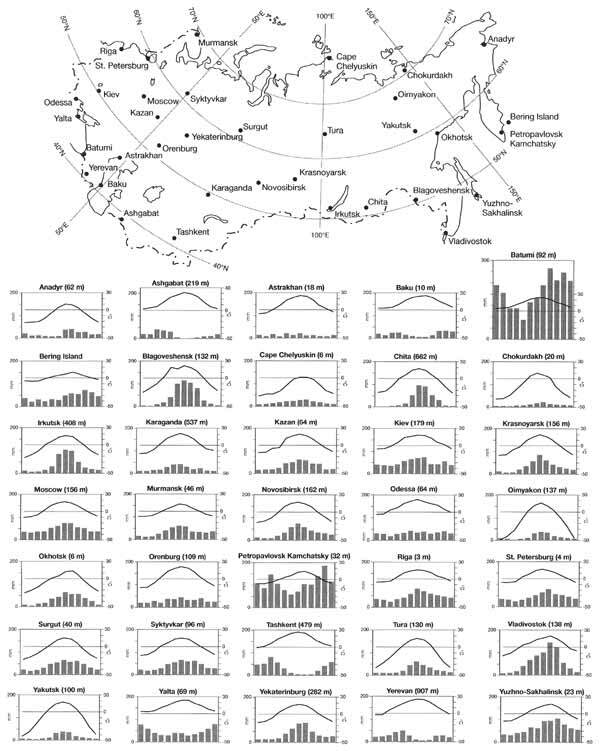 However, it is the occurrence of the secondary maximum in summer that distinguishes the climate of the western Black Sea coast from the real Mediterranean climate which has only one maximum in winter. The amount of precipitation increases towards the eastern part of the Black Sea and the Colchis lowland from 390 mm in Odessa to 2500 mm in Batumi, while precipitation maxima shift from winter and midsummer to autumn and winter. The winter precipitation in the eastern Black Sea region is controlled by local cyclogenesis developing on the Polar front, which frequently migrates here, passage of the Mediterranean depressions and orographic enhancement of precipitation. In the late summer and early autumn, the warm sea surface predetermines the development of convective rainfall. The highest precipitation in the FSU, averaging 2620 mm a-1, is registered here at the Mount Achishkho at an elevation of 1880 m. Further east, in eastern Transcaucasia and especially in Central Asia, precipitation totals decline dramatically to 200-400 mm and annual distributions are different. The principle maximum occurs in spring, when the Iranian branch of the Polar front migrates into the region, while in summer precipitation is just a few mm (Figure 3.10). In eastern Transcaucasia, a secondary maximum is observed in the late autumn. This maximum is less pronounced over the landlocked Armenian-Dzhavakhetian plateau but more so over the Caspian coast where frontal precipitation intensifies. The Caucasus and mountains of Central Asia have complex spatial and seasonal precipitation distributions which are to a great extent controlled by local conditions. Most of the Far East experiences a precipitation maximum in July and August when the summer monsoon arrives but only the southern part of the Russian Pacific conforms with the simple summer maximum and winter minimum distribution. Further north, over Kamchatka, the Kuril, and Komandorskiye islands, the annual distribution of precipitation is much more complex: typhoons bring about heavy rainfall in autumn while intense cyclonic activity predetermines strong precipitation between November and March (Figure 3.10). Duration of precipitation varies spatially and seasonally. The mean intensity of precipitation varies from 2-5 mm h-1 in the north to 15-18 mm h-1 in the south (Borisov, 1965). The most prolonged precipitation outside the monsoon region occurs in the late autumn and winter months and is associated with slow moving or stagnating depressions. Although such precipitation can fall continuously over a period of a few days, both daily maxima and the total amounts are seldom high. Daily precipitation maxima, associated with convective storms, occur in summer, declining from south-west (about 200 mm day-1) to north-east (80 mm day-1) in the European territory and from south (80 mm day-1) to north (40 mm day-1) in the Asiatic part (Borisov, 1965). The highest daily maxima occur in the southern mountains and their distribution, frequency and magnitude are controlled by a multiplicity of local factors such as aspect, altitude, and exposure to moisture-bearing flows. In contrast to the rest of Northern Eurasia, the duration of precipitation and its amount are closely connected in the monsoon region. In the late summer, during the strong monsoon, rain can fall continuously for a period of over 10 days, yielding over 300 mm (Petrov, 1980). Heavy showers are often accompanied by thunderstorms and hail which can be of both frontal (western part of Northern Eurasia and coastal regions) and air mass (landlocked regions) origin. These are most typical of the southern belt extending from Moldova to the Caucasus and the mountains of Central Asia. The unusually high thunderstorms and hail activity occurs in the Caucasus at the altitudes of 2000-2800 m where a number of factors conspire to produce frequent and vigorous thunderstorms and hail: strong insolation, high absolute humidity, frequent passage of weather fronts, exposure to the moisture-bearing flow and, of course, orographic uplift. The average number of days with hail varies between 5-8 per annum in the Greater Caucasus and exceeds 10 days in western Georgia and some regions of the Lesser Caucasus. In the foothills and on the adjacent plains, frequency declines to 3-6 days but it is here, in the main agricultural regions, that hail is most damaging (Goral and Fedchenko, 1992). The prevention of hail via the suppression of growth of cumulus clouds before they reach the hail stage is used in the Caucasus and other areas.